Lobster ME, a Las Vegas-born brand, has opened its second location, within the Grand Canal Shoppes, near the food court at The Venetian. The Maine lobster-inspired menu features a variety of lobster rolls, each of which includes the meat of a one pound lobster, such as the original Maine-style roll with chilled lobster meat, a touch of mayo and subtle spices, and the Connecticut roll with warm lobster meat tossed in melted butter. Other items include lobster tacos, lobster mac and cheese, lobster bisque and lobster grilled cheese. For breakfast, there's lobster and waffles, a lobster scramble, New England-style French toast and the Lobster ME muffin. Lobster ME's other location is inside the Miracle Mile Shops at Planet Hollywood Resort & Casino, and a Lobster ME food truck serves lobster rolls to guests around the Las Vegas Valley. Lobster ME, 3355 Las Vegas Blvd. S., Las Vegas, NV 89109, 702-414-1000, 877-883-6423. Yusho, the Japanese-inspired grill and noodle house by renowned Chicago chef Matthias Merges, has made its debut at the Monte Carlo Resort & Casino. The 250-seat venue, designed by Rachel Crowl of FC Studio, was inspired by vintage industrial spaces, anime and Japanese ramen shacks. It features exposed brick walls, natural wood surfaces, stained concrete floors and warm-hued upholstery. Tables strategically placed around the open kitchen provide guests a front row seat to the culinary action, while the outdoor patio overlooks the Vegas Strip. Menu items include fried chicken made with fermented chili, green tea and seasoned with a sprinkling of lime zest; Logan poser ramen, a robust soup featuring crispy pork shoulder croquette, poached egg, nori and cucumber; charred octopus grilled over an open flame and served with green beans, crisp enoki mushrooms and topped with a light ponzu vinaigrette; marinated eggplant steam bun filled with Japanese mint, plums and broccoli; and doughnuts made with tofu, sweet potato and a hint of rosemary. Yusho is open daily for dinner. Yusho, 3770 Las Vegas Blvd. S., Las Vegas, NV 89109, 702-730-7777, 888-529-4828. Station Casinos LLC has announced it will invest $20 million over the next year in Green Valley Ranch in Henderson and introduce four new bar and dining concepts. The new concepts include Mercadito, with Mexican fare from the Sandoval brothers of Chicago; Tippling Hall, a collage of beverages with innovative and creative presentations paired with a menu of globally inspired comfort food crafted by chef/partner Guillermo Tellez; a second Southern Nevada location of Tony Gemignani’s Pizza Rock; and Tony’s Slice House, a small casual venue serving slices of Gemignani’s New York, Sicilian and California-style pizzas. Construction will commence soon and will be completed by spring 2015. Green Valley Ranch, 2300 Paseo Verde Pkwy., Henderson, NV 89052, 702-617-7777, 866-782-9487. BLVD Creamery has opened within the new plaza facing the Vegas Strip at the Monte Carlo Resort & Casino. Twenty-four ice cream and sorbet flavors from a rotating roster are available each day. Flavors include traditional vanilla, chocolate and strawberry, and new creations such as #WTJ --- watermelon sorbet infused with jalapeño, or B.T.A. --- ice cream created with avocado, oven-roasted tomatoes and bacon. Ice cream sandwiches may be made to order and catered to each guest’s preference with ice cream sandwiched between cookies, waffles, brownies or donuts. BLVD Creamery is open daily 11 a.m.-11 p.m. BLVD Creamery, 3770 Las Vegas Blvd. S., Las Vegas, NV 89109, 702-730-7777, 888-529-4828. 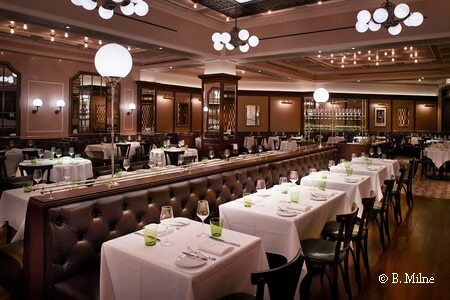 Chef Daniel Boulud’s DB Brasserie has opened inside The Venetian in the former space of Valentino Las Vegas. The décor features an exterior façade clad in travertine limestone panels, a faux-skylight reminiscent of those in classic Beaux Arts train stations and laser-cut blackened steel glass ceiling panels anchored by Art Nouveau-style brass globe pendant light fixtures. The menu, created in collaboration with executive chef David Middleton, includes poissons fumes, pissaladiere, poulet croustillant and the DB Burger; and desserts of chocolate & salty peanut bombe and apple tatin. A wine program of approximately 300 international selections features the best French producers; and new American wine regions showcasing domestic varieties beyond the classic Chardonnay, Pinot Noir, Cabernet Sauvignon and Merlot. DB Brasserie, 3355 Las Vegas Blvd. S., Las Vegas, NV 89109, 702-414-1000, 877-883-6423. Wolfgang Puck’s Postrio Bar & Grill at The Venetian is now serving brunch on Saturday and Sunday from 11 a.m.-3 p.m., featuring new dishes crafted by executive chef Mark Andlebradt. Brunch options include corned beef hash; breakfast sandwich with prosciutto, roasted tomato and arugula; classic eggs Benedict with choice of lobster, smoked salmon or spinach and mushroom; and spicy big eye tuna tartare. All guests will be treated to one complimentary sparkling wine, Bellini or mimosa cocktail of their choice. Reservations can be made by calling 702-796-1110. Postrio Bar & Grill, The Venetian, Grand Canal Shoppes, 3355 Las Vegas Blvd. S., Las Vegas, NV 89109, 702-796-1110. Chef David Walzog of the Wynn’s Lakeside restaurant has launched the “Ocean to Table” fish program, a specially curated menu featuring unique species found around the Hawaiian Islands. Chef Walzog traveled to Hawaii and worked side by side with a group of local fishermen to catch seasonal and indigenous species from their fleet of 30 boats. Walzog now works directly with the fishermen, as each morning the head fishmonger personally contacts chef Walzog to advise him on the day’s catch, including opaka, uku, monchong and nairagi. Chef Walzog's selection is packed and shipped that day, enabling the fish to be served less than or close to 24 hours after being caught. Chef Walzog customizes the menu daily to highlight the catches of the day, and the team works with guests to provide insight into the distinct qualities of each species. Lakeside, Wynn Las Vegas, 3131 Las Vegas Blvd. S., Las Vegas, NV 89109, 702-248-3463. Panevino Ristorante & Gourmet Deli has added four new plant-based dishes to its vegan menu: grilled vegetable lasagna --- layers of eggplant, zucchini, squash, roasted tomatoes, roasted bell peppers and mushrooms in a creamy vodka tomato sauce; organic whole wheat spaghetti Mediterranean tossed with roasted tomatoes, black olives, capers, garlic and parsley in a fresh tomato sauce; organic brown rice mushroom and pesto risotto with marinated Italian mushrooms, pesto, mashed avocado and diced tomatoes; and organic “meatloaf” and mashed potatoes, organic legumes, wild mushrooms and herbs on a bed of garlic-and-rosemary mashed potatoes in a fresh tomato and Kalamata-style olive sauce. Panevino Ristorante & Gourmet Deli, Marnell Corporate Center, 246 Via Antonio Ave., Las Vegas, NV 89119, 702-222-2400. Bubbles & Brunch is now being served every Sunday from 8 a.m.–4 p.m. at The Cosmopolitan’s indoor/outdoor Overlook Grill, above the Boulevard Pool deck on the roof of The Cosmopolitan. Brunch items change weekly, and include chicken and waffles, huevos rancheros and blue claw crab Benedict. In addition, handcrafted Bloody Marys, margaritas and mimosas are made tableside. The cost is $35, which includes warm monkey bread with caramel and pecans, bottomless Champagne or mimosas, and a choice of one entrée. Reservations are encouraged and can be made by calling 702-698-7970. The Cosmopolitan of Las Vegas, 3708 Las Vegas Blvd. S., Las Vegas, NV 89109, 702-698-7100, 877-551-7772. Jeremy Pacheco has been appointed executive chef of Society Café Encore. Pacheco grew up on his family’s farm in Arizona and, after studying at the Scottsdale Culinary Institute, held positions as executive chef at Lon's at the Hermosa Inn in Paradise Valley, Arizona, where he sourced ingredients from his own half-acre garden, connecting with the farm-to-table process; and in Las Vegas as chef de cuisine of SW Steakhouse, as tournant chef of Encore and Wynn and chef de cuisine at Society Café Encore. Society Café Encore, Encore Las Vegas, 3131 Las Vegas Blvd. S., Las Vegas, NV 89109, 702-770-5300. Master sushi chef Gen Mizoguchi has left Kabuto Edomae Sushi, the traditional Edomae-style sushi house in Chinatown. Taking over is chef Ken Hosoki, who had been working alongside Mizoguchi. No changes to the menu, preparation style, or fish-vendor sources is expected. Mizoguchi plans to remain in Las Vegas to create his own project. Kabuto Edomae Sushi, 5040 W. Spring Mountain Rd., Ste. 4, Las Vegas, NV 89146, 702-676-1044.